Don’t know what you want for Christmas yet? Let us help you! Read about 7 top destinations that can be on your 2017 wish list! Don’t know what you want for Christmas yet? Let us help you! We’ve culled a list of Collette's magnificent tour destinations that will have visions of travel bags dancing in your head. Don’t be afraid to dream big. ‘Tis the season for that, after all. London, Prague, Rome, Paris—all the iconic places you’ve been dreaming of seeing can be experienced on this tour through the most exciting and historic cities in Europe. Picture yourself having dinner at a traditional English pub, touring the fairy tale city of Prague or learning about the rich history of the Colosseum in Rome. Europe is always a good idea. Located in the southern end of South America, Patagonia is shared by Argentina and Chile. Chilean Patagonia is a magnificent spot to take in the rugged coastline, islands and incredible scenery. Choose to go horseback riding, cycling, trekking, kayaking or rafting in this incredibly scenic getaway. When in Antarctica, our travellers love to go watching for whales. The magnificent creatures are easy to study up close from the water, but they aren’t the only wildlife attraction! Antarctica is home to many different species of penguin like adélies, chinstraps, emperors, gentoos, macaronis and kings. Together, Dubai, Oman and Abu Dhabi form The United Arab Emirates, one of the most ultramodern, technologically advanced parts of the world. But beneath the sky high buildings and glitzy attractions beats the heart of nomadic people who herded and fished there as far back as the 3rd millennium BC. Even though the area has changed a lot since the days of its first inhabitants, the culture is still strongly embedded within the Islamic traditions of Arabia, while still being home to a diverse array of cultures and nationalities. Get ready to enjoy the majesty of untouched landscapes, ancient glaciers and lots of wildlife on a breathtaking adventure through some of mother nature’s finest work. Explore a real gold rush ghost town in Dawson City, visit jovial Chicken, Alaska and soak up some true frontier spirit. Don’t forget to try the salmon in Fairbanks, Alaska. It doesn’t get any fresher! Travel through the Andes mountains and semi-tropical jungle in a domed train on your way to glorious Machu Picchu, the “Lost City of the Incas.” After spending the night in your hotel at the base of Machu Picchu, spend time visiting key places in the area. Go snorkelling near playful seal lions off Floreana Island before you fly to San Cristóbal Island. Board the m/v Galapagos Legend and head out for an up-close look at the endangered tortoises that live on a special reserve. On Santa Cruz Island, visit the Charles Darwin Research Station and see some of the giant tortoises from the station’s breeding ground. This trip leaves no stone unturned when it comes to visiting some of the world’s most legendary sites. Botswana awaits with an amazing South African experience. It may be small but it certainly makes up for it with plenty of big adventures. While you’re there, visit national parks, game reserves and sanctuaries to enjoy the diverse wildlife in the deserts, grasslands and savannas. In South Africa, luxuriate in gorgeous resorts in between embarking on open-air wildlife safaris and city tours through vibrant places like Cape Town. Magnificent Victoria Falls in Zimbabwe is considered one of the Seven Natural Wonders of the world. While it’s not the highest or the widest in the world, it’s considered to be the biggest based on combined height and width. Breathtaking doesn’t even begin to describe the sheer power of this tremendous sheet of falling water. There are many reasons to visit Australia. It’s rich culture, flora and fauna, cuisine, stunning landscapes and architecture make it a traveller’s paradise. Dive deep to see The Great Barrier Reef, ride the Skyrail Forest Cableway or climb the Syndey Harbour Bridge. There’s never a dull moment in The Land Down Under. There’s something for everyone on this list. 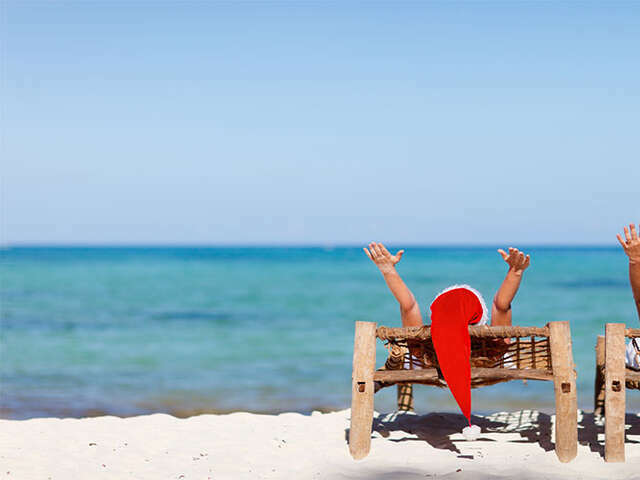 Whether you’ve been naughty, nice or a little bit of both, we think Santa should treat you to a wonderful adventure! Which one will you be putting in your letter?